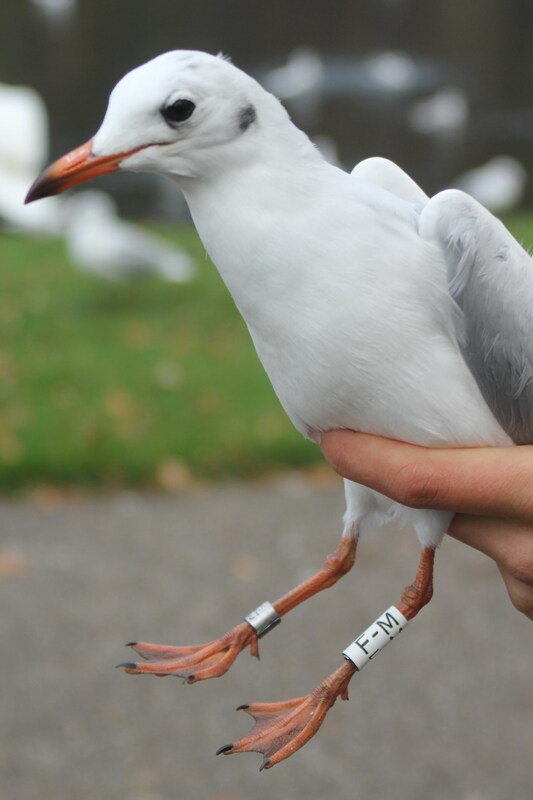 BIRD RINGING RESEARCH ON BLACK-HEADED GULLS (Larus ridibundus) - WINTER GUESTS. 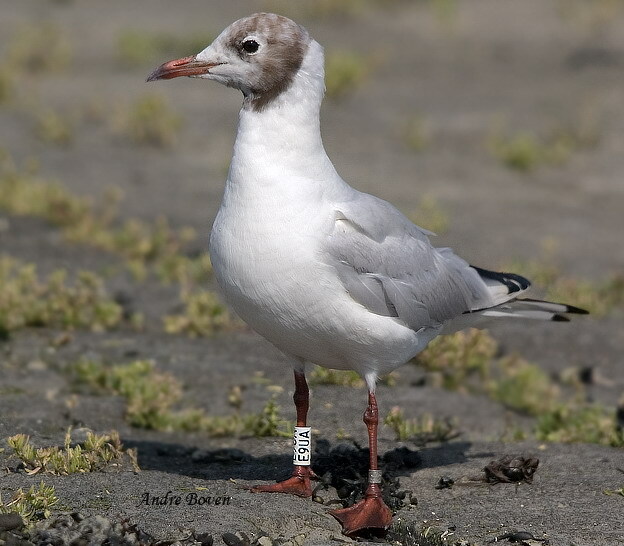 The main question in the long-term colour ring research is: What is the survival and site fidelity of the Black-headed Gulls which winter in The Netherlands? In Amsterdam (1997-2003 and 2006-present), Arnhem (1996-present), Baarlo (2010-present), Deventer (1996-2005), Den Haag incl. Voorburg and Leidschendam (2011-present), Groningen (1996-present), 's-Hertogenbosch (1998-2003), Hilversum (1996-present), Kampen (1996-2003), Maastricht (2010-present), Roermond (2010-present), Utrecht (1996-2003) and Zoetermeer (2011-present Black-headed Gulls have been colourringed. 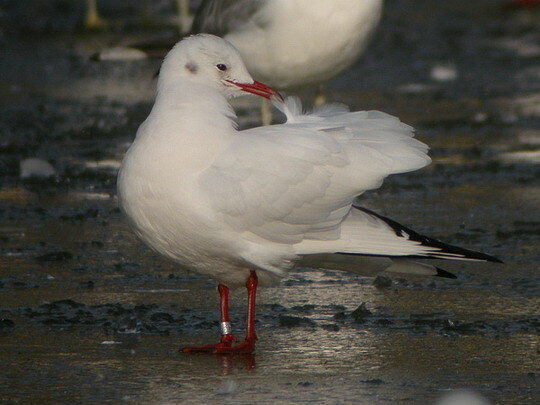 See here for a unique list of all ring recoveries from by me, in the winter ringed Black-headed gulls. See each month on the map. Each winter approximately 15 first winter birds and approx. 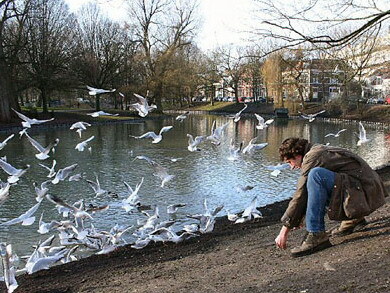 15 adult birds have been colourringed in a given city. Ringing is done as much as possible during the months November and December. In those months there is almost no migration of birds which travel through, and most Black-headed Gulls are at their wintering site. Moreover, in the last winter months there is still time available to read the bird rings. Beside that, also some birds are ringed with only metal ring (see table below). Groningen, Jan 18th 2004. © Ana Buren. Arnhem, December 22nd 2007. © Arjan Boxem. See here a video about the catch and ringing Larus ridibundus and Larus canus by Frank Majoor e.a.! Red with 2 numbers and/or letters: 2004-current. White F-M. Arnhem, Musis Sacrum. Novembre 2011 © Jeroen Nagtegaal. 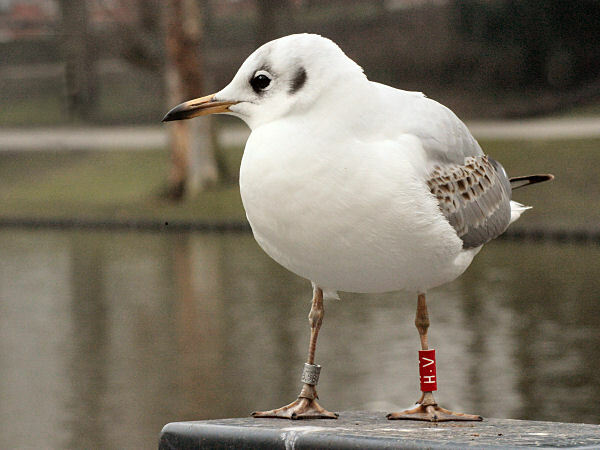 Next to standardised bird ringing, a number of Black-headed Gulls which were ringed already abroad, have been fitted with a colour ring. LAA-LZZ (the remaining white rings with three letters are ringed in Denmark by Kjeld Pedersen). White E9UA - Termunterzijl, augustus 2010. © Andre Boven. 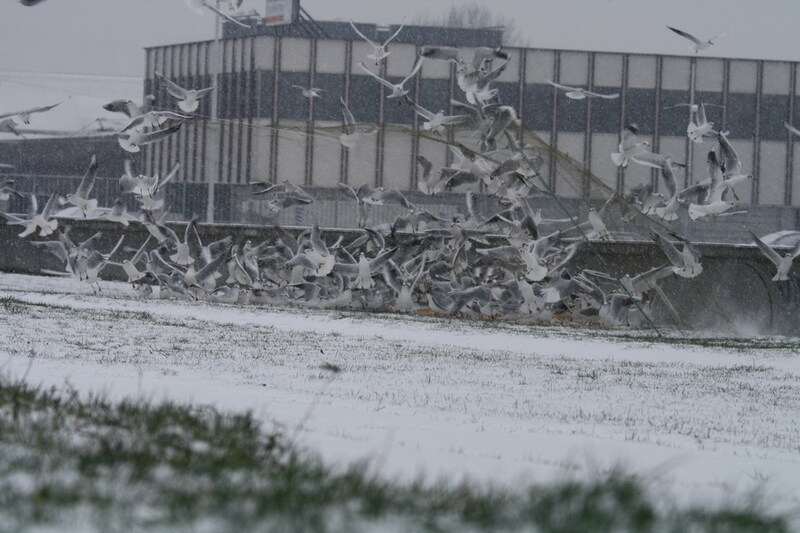 The Black-headed Gulls in The Netherlands which stay here in winter mainly breed in the countries around the Baltic Sea. The main direction of migration is from NE to SW. A small part originates from the north (Norway) or from the east (Chechia and Slovenia) and some migrate from the southeast (Hungaria) to the Netherlands to stay here during the winter. seen by Frank Majoor in The Netherlands, November - February. Most of the Dutch birds which breed here, and after the breeding season migrate towards the south (Belgium, France and Spain) or to the southwest (England and Ireland). A small group flies to the southeast (Italy). 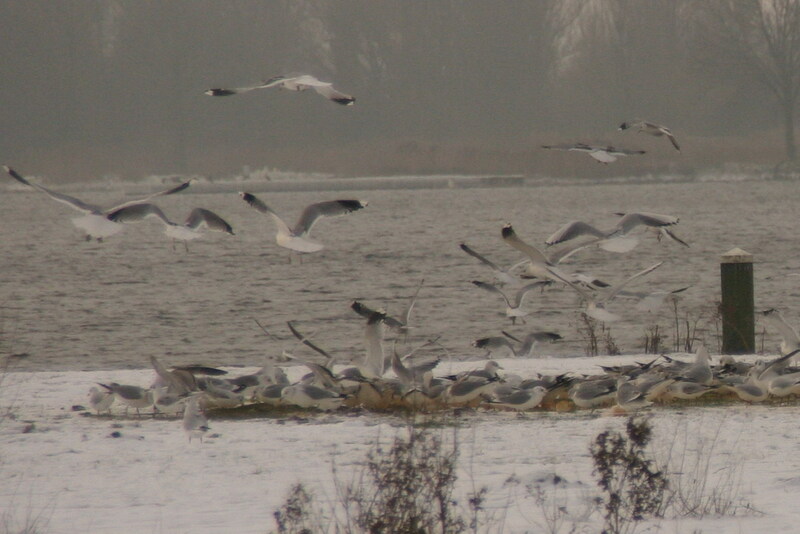 In addition, there is a small number of birds which remain in The Netherlands during the entire year. Leucistic Black-headed Gull. Amsterdam, December 2008. © Ruud Altenburg. White E9KK. Svanedam, Nykøbing Falster, Denemarken. 10 december 2011. Photo Kjeld Pedersen. There are Black-headed Gulls which depart from their breeding areas, arrive early in The Netherlands (Yellow 13, White LSL and Blue A6) on an annual basis (July-August) and Black-headed Gulls which arrive late (October-November) on an annual basis (Yellow AH). In September there is no arrival or migration of Black-headed Gulls! A part of the group of birds which has arrived early, migrates later (October-November) towards the South (Blue A6 and White LSL) and another part of this group stays in The Netherlands during the entire winter (Yellow 13). 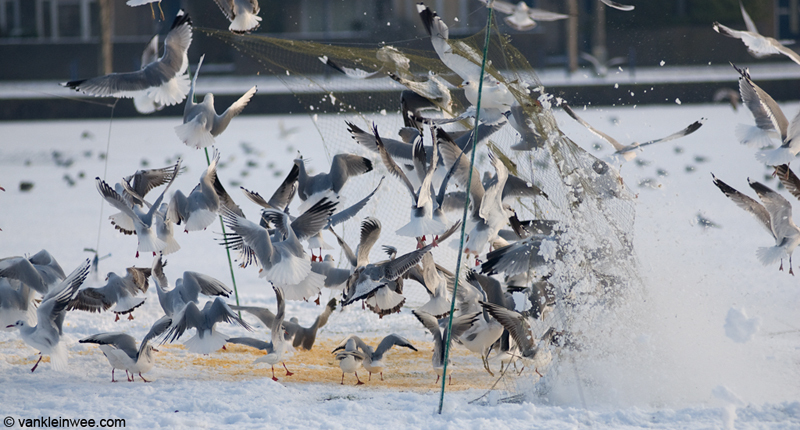 Approximately 30% of the wintering Black-headed Gulls in The Netherlands flies towards the south at the onset of a severe frost period (White LFY). Many Black-headed Gulls are faithful to their breeding area and in a lesser extent to their wintering area. It is also possible that after wintering some years in The Netherlands Black-headed Gulls suddenly wintering somewhere else (White LZH, Yellow VU, Yellow 3Z and White LKU). I addition there are wanderers without a fixed site (Yellow H1). Some interesting life histories are shown here.